Received the following e-mail from Terry McCarl terryamccarl@gmail.com of Plattsmouth, NE: "Dear Murray and Mike, I just sent my membership application and dues in about a week ago. 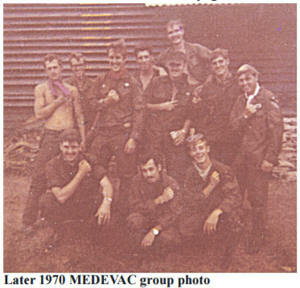 I was in HSC 15th Med BN from November 68-November 69. I was the Division Sanitarian, a 1LT on the staff of LTC Guthrie Turner and later, LTC Joseph McNaney. I retired about 18 months ago, and, as sort of a hobby, been trying to get in contact with some of my old compadres at 15th Med. Using the Internet, I have made contact with about a dozen of them. I would like to contact several others. Just the other day someone suggested that I contact your association. I had looked at 1cda.org long ago, but hadn't realized that you have a found and find department. I also hadn't realized that I could read your Saber articles on line. I am about 1/3rd of the way through them and am finding them very interesting, with a few references to some people that I knew. "I understand that to get into the 'found and find' that I need a password from Murray. Would it be possible to have that e-mailed to me? "Thanks, and look forward to hearing from you." 15th MED Assn. President Art Jacobs will be retiring by the Sacramento Reunion, 16-21 April, 2013. He'll have a successor. Murray Gibbs, Webmaster/Past President 2003-2006, 15th MED Association notifies that the final draft of the new proposed Constitution & By-Laws for 15th MED Assn. have been posted on the Website. 1st Cav. Div. Assn. Executive Director Dennis Webster forwarded and says, "Mike, The Association received a letter from a widow of a 15th MED NCO, MSG (Ret) Gordon Russell on 27 March. This was after we sent SABER to the printer and I am passing this to you per her request. "You wrote about him in the July/August 2012 SABER in a letter or e-mail from Dan ‘Fang’ Toothman and also mentioned him in the January/February SABER with a note from Ron Strub. "Mrs. Maria Russell wrote: 'I am writing in regard to the article in January/February SABER News. Mike Bodnar is asking what happened regarding SFC Gordon L. Russell in SABER on page 17. 'Well this Gordon Russell was my husband of 61 years. He passed away May 17, 2012 in Columbus, Georgia. He was still as handsome as a 70 year old. He was 93 and the best husband and a very loyal American. We married in Rhein Main, Germany and a year later came to the states (Mineral Wells, Texas). We had a wonderful life ever after. 'Please pass this on in your next edition. 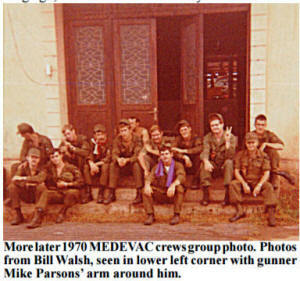 Thank You Maria Russell, PO Box 2005, Leicester, NC 28748' " Received e-mail links from MEDEVAC gunner Ricky Goodson r.agoodson@yahoo.com and Medic Bill Walsh cpd9283@comcast.net for radio pop music of the Vietnam War era.